And there's even some Ferrari F50 influence. 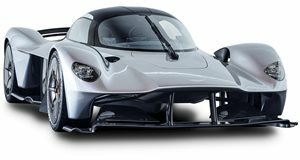 For Aston Martin, its upcoming Valkyrie is not only new territory for the brand but for the industry as a whole. It’ll be the closest thing to a street legal Formula 1 car, even more extreme than a Ferrari LaFerrari. And to help make that happen it’ll come powered by a naturally aspirated 6.5-liter V12 engine, courtesy of Cosworth. Total output is said to be over 1,000 hp but we’ll find out precise details later this year when the production version is finally unveiled. We spoke with David King, Vice President and Chief Operations Officer of Aston Martin at this year’s Geneva Motor Show and he revealed something quite interesting about that V12. "I can’t give you a specific number but it’s a lot lighter than our V8 engine in our road cars.” That 4.0-liter twin-turbocharged V8 engine is sourced from AMG and produces 503 hp and 505 lb-ft of torque. The upcoming 6.5-liter V12 will have around double the output and weigh even less. Impressive. So why did Aston Martin, in 2018-2019, use a nearly 25-year-old supercar as an example of what to do today? Because the F50 was another F1-derived supercar. "(Bolting the engine to the chassis) is not done very often on a road car. It creates a number of challenges but it saves a lot of weight and it’s very structurally efficient,” King said. "It wasn’t really so much benchmarking but rather to reassure ourselves that we weren’t going to create a big problem.” King also mentioned that Valkyrie buyers will be the first to learn all of its details, including final output, weight, etc. As for the rest of us, we’ll know in less than a year’s time.